Having survived their childhood ordeal to become legendary witch hunters, Hansel and Gretel battle an evil coven that plans to use kidnapped children as a means of gaining immunity to fire. With an unknown danger approaching, young Hansel and Gretel’s worried mother instructs her husband to take their children into the forest. When he disappears, the siblings take refuge in a gingerbread house where they are imprisoned by a witch. Hansel is forced to continually eat candy while his sister stokes the fire. Gretel escapes her restraints and finds that she is immune to the witch’s spells. After freeing her brother, the pair attacks the witch and burns her in her own oven. At a public assembly in the town square of Augsburg, Sheriff Berringer prepares to execute an accused witch named Mina in front of an eager gathering of townspeople. Adult Hansel and Gretel arrive in time to prevent the execution. Gretel holds the sheriff at gunpoint while Hansel inspects the woman. Hansel declares that Mina is not a witch when he cannot find any signs of rot on her body. It is revealed that the witch hunters were hired by Mayor Englemann to track down the children that have gone missing from the village. A boy named Ben is starstruck by the duo while the sheriff feels upstaged and undervalued. After an insult, Gretel punches Berringer in his nose. Hansel and Gretel begin their investigation at a strange cottage in the nearby forest. They capture a witch there and find documents indicating that something is being planned for the upcoming Blood Moon. Jackson is assigned to be their guide when they next return to search the forest. Meanwhile, the sheriff tasks his own team of bounty hunters to track the kidnapped children. At their campsite in the night, grand witch Muriel kills all but one of these men. The lone survivor is cast under a spell that has him eating worms out of the ground. In Ausburg’s tavern, Hansel and Gretel review plans with Jackson when Ben interrupts to show them his scrapbook collecting news clippings about the duo’s exploits. Gretel admits that a witch’s magic does not affect them. Sent as a warning by Muriel, the surviving tracker enters the tavern and explodes all over the patrons. Gretel identifies it as the Curse of Hunger for Crawling Things. Elsewhere, a large troll is shown tending to the imprisoned children. Muriel and two other witches consume some of the children’s blood, revealing that it has the potential to make them immune to fire. Gretel dreams of her mother. Hansel reminds her that is something they do not discuss. The next day, Mina finds Hansel making purchases at the market. They talk for a bit. Hansel reveals that he has the “sugar sickness” and has to take an injection at regular intervals ever since the witch made him eat all that candy as a child. Hansel uses his market purchases to create a dummy with a phonograph that plays a recording. The ruse lures one of Muriel’s witches in the forest. After a protracted struggle, Jackson uses an electric jolt device to subdue the witch. She is imprisoned in the sheriff’s office over Berringer’s protestations. Hansel and Gretel’s interrogation confirms that the witches are planning something around the Blood Moon. Gretel realizes that 11 children have been kidnapped. Six are boys and five are girls, each born in a different month. The siblings realize that the witches need a girl born in April. Hansel searches the records in the sheriff’s office to find the girl they need. At the same time, Muriel rides on her broomstick and sets fire to the town. She confronts Gretel and reveals that she has the ability to change her face. She also says that Gretel possesses the last ingredient she needs. Muriel uses a spell to make Jackson shoot himself and then she frees the captive witch. After the troll kidnaps the remaining little girl, Hansel is dragged away from town while clutching the broomstick of a third witch. Ben nurses Gretel back to health the following morning. She talks a little about her history and mentions that Muriel is a grand witch. In Ben’s scrapbook, Gretel finds a picture of her mother that identifies her as a witch. Mina finds Hansel caught in a tree and treats his wounds at a pond of healing water. They bathe naked and kiss. Gretel searches the forest for her brother but is captured and beaten by Berringer and his men. The troll kills all of the men and rescues Gretel. He treats Gretel’s wounds and tells her that his name is Edward. She asks why he helped her. Edward explains that as a troll, he is bound to serve witches. He then leaves. Hansel finds an abandoned cottage in the woods. He is attacked inside, but it turns out to be his sister. Underneath the cottage is an unusual witch’s lair. They realize that they are actually in their childhood home. Spells do not work on them because their mother was really a witch. Muriel appears and tells them the rest of their history. To complete their fire immunity potion during the Blood Moon, the witches need the heart of a Grand White Witch. But Gretel’s mother was too powerful, so they needed Gretel’s heart instead. Muriel used a rumor to put the townspeople after their mother. That is why their father was instructed to take Hansel and Gretel into the forest. Their father was hanged and their mother was burned. Muriel then stabs Hansel after a fight and escapes with Gretel. Hansel awakes. Mina treats his wounds again. She reveals that she is a white witch. He did not detect it because she does not have the same rot as a dark witch. She tells Hansel where Muriel and her coven is probably gathering. In the cottage’s underground lair, she also finds a grimoire with a spell that will render the dark witches’ wands powerless. Mina uses the spell to bless ammunition and several guns. Mina, Ben, and Hansel set out to rescue Gretel and to stop Muriel. Gretel awakes as a captive. Edward is an unwilling servant of Muriel, but Gretel pleads for his help. The rescue party sets traps in the woods. Ben is left with a gun in the forest below while Hansel and Muriel ascend a mountain where the coven is gathering. At the gathering, Hansel offers the assembled witches a chance to leave, but is laughingly ignored. He then begins firing his gun and the witches realize that they are not immune to his weapons. Mina fires on them from above with a gatling gun. Edward frees Gretel while the children are rescued. When the sun rises, Muriel and the remaining witches escape. At least one witch is caught in a razor wire trap set between two tress. Ben is able to shoot down Muriel’s broomstick. Gretel uses her electric jolt device as a defibrillator to revive Edward, who had earlier been knocked out by Muriel. Hansel, Ben, and Mina search for Muriel. Outside Hansel’s childhood home, Muriel incapacitates Mina and holds Ben hostage. Hansel intentionally shoots Ben to get him out of the way and then unsuccessfully tries to shoot Muriel. She incapacitates Hansel. Mina recovers and confronts the dark witch, but is stabbed in the process. Hansel recovers and fires at Muriel until she falls through the doors into the cottage. Mina dies in Hansel’s arms. Hansel fights Muriel inside the cottage as Gretel arrives. They battle the witch until Hansel is overcome by his diabetes. Gretel is able to give him an insulin injection. Together they overpower Muriel and use a shovel to decapitate her. In an epilogue, Hansel and Gretel are paid a sack of coins before walking away from a burning witch pyre. With Ben and Edward as part of their group, they are then shown hunting a new witch in the desert. While Wirkola continues to unashamedly pilfer the pockets of Raimi and Jackson, the similarities between “H&G” and “Dead Snow” (review here) are so strong that I believe Wirkola has graduated into a discernible style of his own, despite how many components may be borrowed from his idolatrized influences. His mix of the other two directors is more of a specific, personalized formula than it is a slapdash hodgepodge. In fact, “H&G” is so similar in tone to “Dead Snow” that the two films could be confused for fraternal twins. Years after surviving their familiar gingerbread house ordeal, the titular siblings earn the second half of their moniker by helping a European hamlet recover its kidnapped children from a plotting coven of evil witches. Any more setup than that, and it would be a different movie. The title reveals everything there is to know before seeing the film. 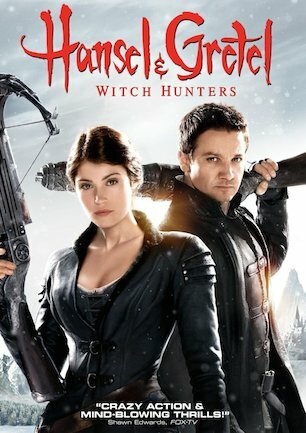 If the words “Hansel and Gretel – Witch Hunters” do not conjure up a specific enough mental image of what is in store, the cover artwork or one-sheet should fill in any gaps. “H&G” knows what it wants to be. It is casual entertainment and never pretends to be anything more than a Brothers Grimm fairytale re-imagined as “Evil Dead” meets hyper-stylized kung-fu action. As long as that is understood at the outset, there is little reason to anticipate disappointment. Looking for satisfaction anywhere other than the immediate senses of sight and sound would be unwise. Wirkola’s M.O., altered little since “Dead Snow,” is to have “Hansel and Gretel” play with an “Army of Darkness” bent that straddles the border between horror and comedy. There is not as much comedy as might be expected for a film with Will Ferrell as a producer, only enough to serve as a reminder that the movie is never meant to walk a completely straight line. Yes, I lifted the second part of that sentence straight from my other review. If the director can borrow from his previous work, I should be able to do it too. The narrative then becomes a showcase for high-energy action and sight gags. Establishing plot and characterization are secondary goals to creating visual fireworks. This is a simple approach that worked well enough when it was used in “Dead Snow,” but falls short of completely satisfying this time around. “H&G” can only be as strong as H&G are themselves, and their character appeal is not as compelling as it could/should be. While not devoid of personality, Jeremy Renner and Gemma Arterton are often as stiff as their leather outfits. The blame is not to be laid on their performances, however. Actors can generally only be as good as the material they are given, and action heroes are usually only as good as their one-liners. H&G were already underdeveloped before Renner and Arterton put on their costumes. In a clever twist on the familiar fairy tale, Hansel has developed diabetes from all of the candy he ate in the gingerbread house as a youngster. Like too many of the fun ideas in “H&G” though, the diabetes angle is not used for much. It gives Hansel a weakness that comes into play exactly one time in the movie, at the most expected moment, but the fact that diabetes is his specific handicap is irrelevant. It could have been anything that incapacitated him for that particular purpose. Gretel’s identifiable trait is the ability to be knocked down, if not completely unconscious. They are legendary figures that should be larger than life, but only exhibit enough character to move things along to the next scene. The reason why flat characters were acceptable in “Dead Snow” was because they did not matter as much. They were more of a prop and not the centerpiece of the movie. Hansel and Gretel are a means to an end as well, in a way, but they themselves have to be more exciting than what is going on around them. After all, the title is specific that the movie is about these two characters. And the likability and personalities of its main characters are crucial to making the movie work. Instead, the most interesting things on the screen are the creatures and sets. A coven assembly near the climax showcases a gorgeous assortment of deformed witches and grotesque crones. I imagine the FX shop was given the two-word instruction of “go nuts” and that is exactly what they did. In another smart decision, a troll who becomes a central figure is fabricated with a mix of animatronics and a costumed actor. With so many similar monsters in other films being generated with ones and zeroes, it is refreshing to see this beast take on a different, more realistic look. The only problem with the creatures and ancillary setpieces is that they are more fun than the two figures at the heart of the story. I could not help but look at some of the coven witches and wonder what their stories were. I wish I had felt the same about H&G. Compared again to “Dead Snow,” “H&G” has more of a stop-start momentum that carries it though the running time. “Dead Snow” had the luxury of explaining the setup in one go at the start of the film. The rest of the movie could then be handed over to mayhem. The story in “H&G” is more revelatory. Character backgrounds are uncovered gradually. Plot points are revealed as various motivations unfold. What ends up happening is that loud scenes of H&G battling witches while fire crashes through walls are sandwiched between slow moments of exposition. When the action stops to regroup the characters or provide information, the less compelling aspects of the movie have time to catch up. If one is going to make a movie in this vein, Sam Raimi and Peter Jackson are the right two directors to emulate. But Sam Raimi eventually went from his “Evil Dead” roots to the major leagues of “Spider-Man.” And on the other side of the globe, Peter Jackson moved from “Meet the Feebles” to “Lord of the Rings.” At some point, style has to evolve before it grows stale. Tommy Wirkola has a firm grasp of what makes comedy-horror fun to watch, although I feel he may be selling himself, and his audience, short. Hopefully he relies less on his idols and trusts more in his own developing talent to offer something truly unique and spectacular on the next go. Imagine “Ghostbusters” if Bill Murray, Dan Aykroyd, and the rest of the cast portrayed less distinct characters. The spectacle of battle against Gozer, Slimer, and the Stay Puft Marshmallow might still be fun to watch, but would ultimately be missing its identity. That is what “H&G” is like. It is not without charm, it just lacks a more memorable personality.